What is Camping Key Europe and what are its benefits for me? - Camping Key Europe (CKE) is a new benefits/identity card replacing the previously used Camping Card Scandinavia and it is recognised in camping sites and holiday villages throughout Europe. From where can I get the Camping Key Europe? - The fastest way to get the card is to buy it online from our homepage. You can buy it also from camping sites reception. From there you get a temporary CKE -card and you can use the benefits of the card immediately. What is a temporary CKE -card? - It is the card you get from the camping site. Because it takes for a 2 weeks to get the plastic CKE -card, you can use the benefits with the temporary card right away. The temporary card is valid until the end of the year marked on it. Temporary Camping Key Europe -card. Why haven’t I got my plastic Camping Key Europe yet, even if I bought it from the camping site already more than 3 weeks ago? - In summertime under the high season we receive lots of card applications every week, and it takes longer than normally to process all the data. During the waiting time you can use your temporary card. Do I have to order the Camping Key Europe every year? 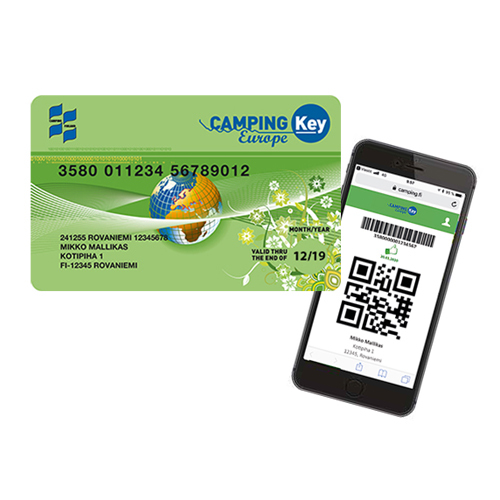 - You can use the same plastic Camping Key Europe -card as long as the data on it is up to date. You only have to buy the validity sticker to your card every year. The card is not valid without a validity sticker or the year in question printed on it. You can buy the validity sticker online from our homepage. How much does the Camping Key Europe cost? - 16 €. The price is the same all over Europe. In which countries can I use my Camping Key Europe? - Camping Key Europe is accepted in 20 European countries on the local associations’ camping sites: Belgium, Croatia, Denmark, Finland, France, Germany, Great Britain, Greece, Hungary, Ireland, Italy, Latvia, Luxemburg, Norway, Portugal, Slovenia, Spain, Sweden, Switzerland and the Netherlands. What is a “Camping in Finland” -brochure? - All the Finnish Campingsite Association’s member camping sites are represented in the brochure, which are about 150 around Finland. There is also useful information on camping holiday in general as well as a map of Finland, where all the camping sites are marked on. From where can I get ”Camping in Finland” -brochure?